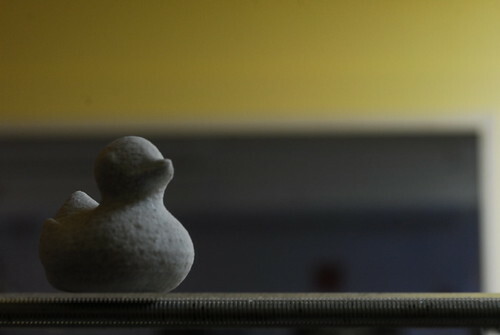 The concept behind our army of ducks is to have a single object as a sample of the various production and fabrication methods we offer at Metrix Create: Space. Using the same object allows for easy comparisons of texture, flexibility, strength, production time, and material characteristics such as shrink rates. The files are scaled to produce a duck that fits into a cube that is about 2x2x2 inches. The mold files take the original duck 3D file and build a box around it that is thick enough to account for the strength of the material from which it will be produced. 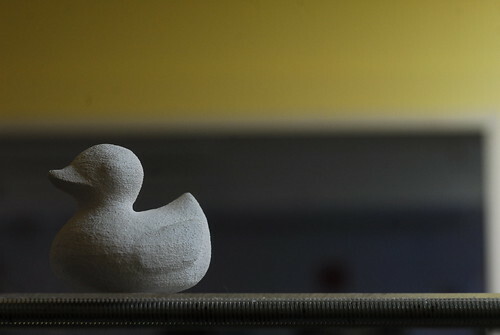 The first ducky is printed in powder on a ZCorp Z400 powder printer. We use hydroperm for the powder material, which is a mix of plaster of paris, portland cement, and silica. It behaves like plaster. The binder used to fuse together the layers of powder in the printer build bed is a mixture of water and alcohol. 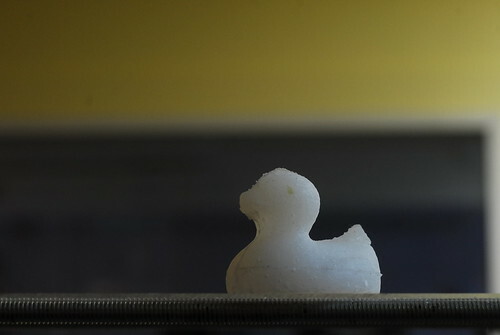 The duck is solid throughout and takes a little under 2 hours to print. Because the powder material tends to be brittle and pretty fragile, printed objects can be dipped in paraffin, which infuses the top layers and makes the objects stronger. The light gray tint to the duck above is due to the paraffin infusion. 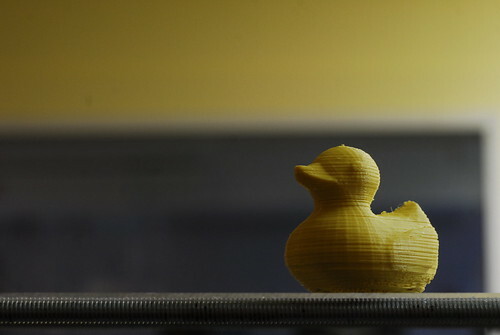 We also printed a ducky on our MakerBot. This one is printed in ABS. The horizontal striation is a product of the way the machine lays down and layers the extruded plastic. The ABS ducky is very durable, waterproof, and lightweight. It takes the same amount of time to print as the powder one; a little under 2 hours. The great thing about powder printed objects is that they behave like plaster cast object, which makes them excellent for making molds for ceramic slip casting. The casting process starts with a two part powder printed mold. It has to be made in two parts because of the complex curvature of the object we are casting. Being able to pull the mold apart allows for the object to be pulled out as one piece. The two parts of the mold come together, as aligned by the circular registration marks. Then the casting material is poured through the opening in the mold. The mold above is actually shown upside down. The pour hole is at the top so the ducky gets cast upside down. This is one of the actual printed molds we used to slip cast some ducks. it took 4.5 hours to print. The large funnel at the opening facilitates pouring the casting material. The initial casting tests we did were with clay slip. This method of casting is a standard one in ceramics. Clay is mixed with water to make it liquid enough to pour into a mold. The porous plaster, or in our case hydroperm, absorbs the moisture from the clay slip, pulling the solid clay particles against the walls of the mold. 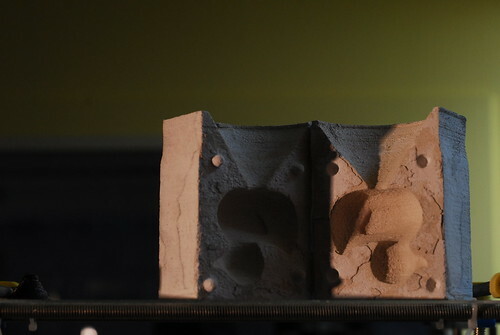 As more of the moisture is sucked out, the cast object starts to separate from the walls of the mold. At that point the mold can be pulled apart and the object extracted. 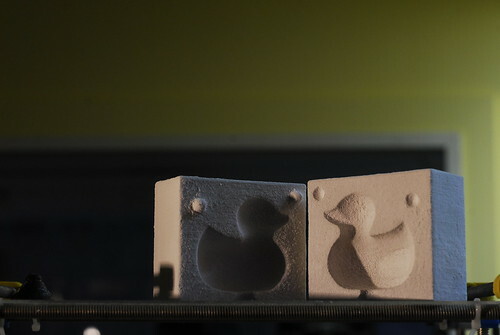 The resulting ducks are hollow and vary in wall thickness based on how long the slip was allowed to sit in the mold before some of it was poured back out. 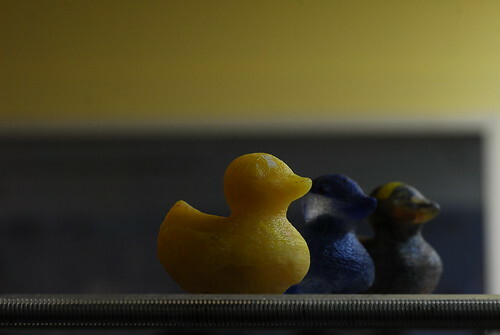 Each duck pour was allowed to sit between 10 and 30 minutes before pouring the left over clay slip out of the mold. 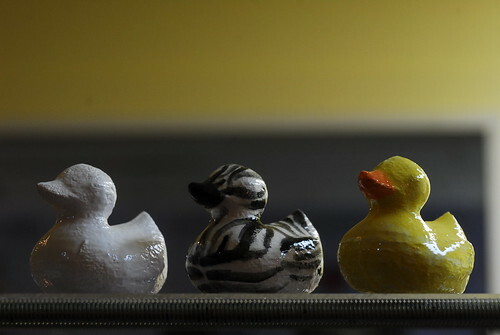 These are some of the resulting ceramic ducks. Once a slip cast duck is pulled out of the mold, it sits for a few days in order to lose more of the water still contained in the clay. Once it is sufficiently dry, it goes in the kiln to be fired at Cone 4 temperatures. This process takes about 7.5 hours and is called the bisque stage of the ceramic object. 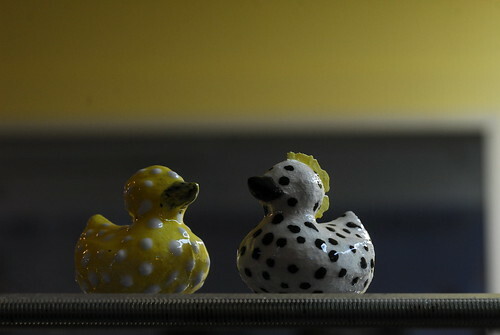 Once it comes out, a bisqued duck is bright white and can be glazed with just a clear overglaze, like the white duck on the left or it can be painted with various color glazes and then covered in overglaze. Once the glazes dry, each duck goes back in the kiln to be fired for 8.5 hours at Cone 6 temperatures, which completes the ceramic ducky process. The ducks that come out are waterproof, fairly durable, and vary in weight based on their wall thickness. Each duck loses about 18-20% of its original size in the drying and firing process. Using different glazes and layering them produces some pretty fancy results. We had the opportunity to also slip cast with porcelain slip, which produced a lightweight, very durable duck with a light gray tint. After firing it, even before glazing, this porcelain has a smooth, satin finish to it. 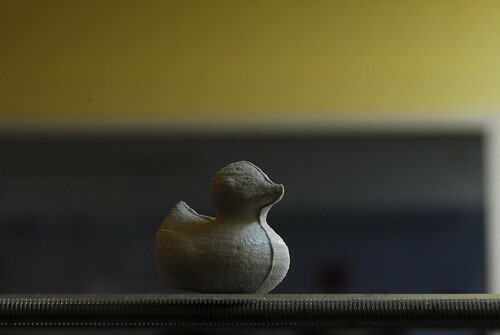 After the porcelain firing process is complete, the duck loses 25-30% in its size due to shrinkage. Once we started casting, we figured we would use our molds for casting some non-ceramic materials. 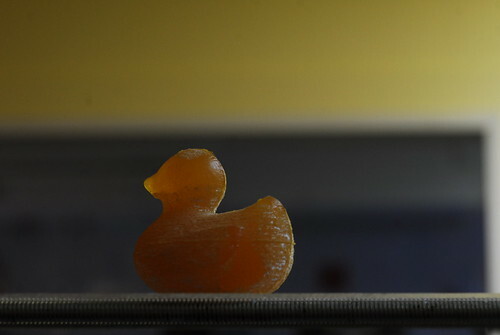 In order to cast a urethane rubber ducky, the mold had to be dipped in wax multiple times. It’s good to space the wax dips so that the wax layers, rather than just getting absorbed by the hydroperm. The thicker the wax layer inside the mold, the easier the urethane object will release from the mold. Also, it will have a smoother texture. This urethane rubber duck is durable and quite bouncy. It sets in about 24 hours and reaches its full curing cycle in 48 hours. We also did a silicone cast version. We used Smooth-On DragonSkin, which is a platinum grade silicone and takes 3-4 hours to set fully. It’s strong and highly heat resistant. It is also very flexible and has a nice translucent quality. Thoroughly waxing the mold for the silicone cast is also recommended. It doesn’t so much affect the release, which is very easy due to the nature of this silicone product, but rather makes for a nicer surface texture. Next we thought we’d try casting glass. It took a few tries to get that process right. We had to produce a fully enclosed version of the duck mold because the glass leaked out of the two-part mold once it melted in the kiln. The glass casting process is a bit different since we start with a solid state product. The trick is to weigh out the right amount of glass pieces to fill the volume of the duck. We fit all the pieces in the funnel part of the mold and everything gets placed in the kiln. The firing happens at Cone 10 temperatures. It takes about 20 hours for the whole process during which the glass is melted and flows into the mold. Once it cools off, the fired hydroperm of the mold breaks away very easily, revealing the glass duck. 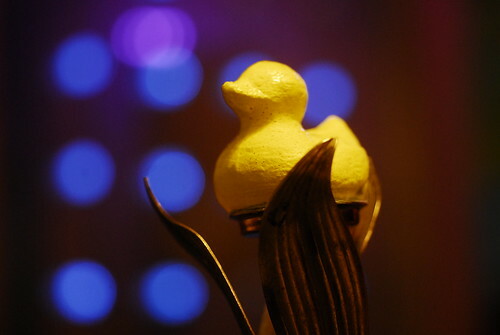 The texture of the mold gives a stippled quality to the surface of the glass ducks. This can be left as it is or filed to a smoother finish. So there you have it! Hopefully our ducks will inspire you to make some fun things of your own. Want to cast something we haven’t done? Bring your material in and we’ll give it a try. Stay tuned for more ducks to come.